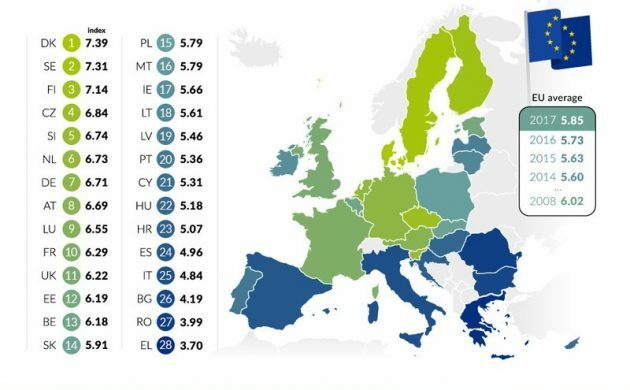 According to the latest Social Justice Index, published annually by the German foundation Bertelsmann Stiftung, Denmark is number one in the EU regarding opportunities for social participation. It was good news for the rest of Europe as well, as the index suggested that social justice was on the rise overall in the EU as the average increased from 5.73 to 5.85 over the past year. “A discernible upward trend is emerging in the EU in regard to social justice. This improvement in opportunities for social participation is mainly being driven by a marked recovery in the labour markets,” the report found. Following the top five, the Netherlands, Germany, Austria, Luxembourg and France completed the top 10. However, not everything is brilliant. The continent is recovering at vastly differing speeds – the gap between northern and southern Europe remains considerable. Greece was ranked bottom of the index, followed by Romania, Bulgaria, Italy and Spain – five nations where “an above-average proportion of children and young people remain at risk of poverty and exclusion”.